When I told my childhood friend in Quebec that we should do something special to celebrate our 40 years of friendship, she suggested Coaticook, an area she knows well. 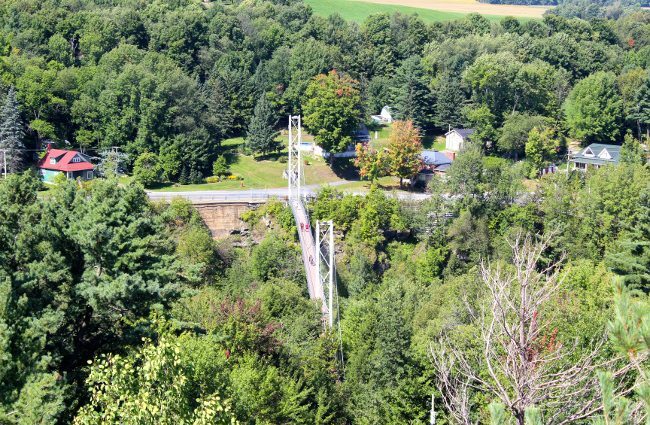 Located in the valley of the same name, the village of Coaticook offers many agrotourism activities, as well as the famous Coaticook Gorge. Canada’s mostly French-speaking province of Quebec is huge, encompassing 22 touristic regions. However, the majority of travellers only visit Montreal and Quebec City. 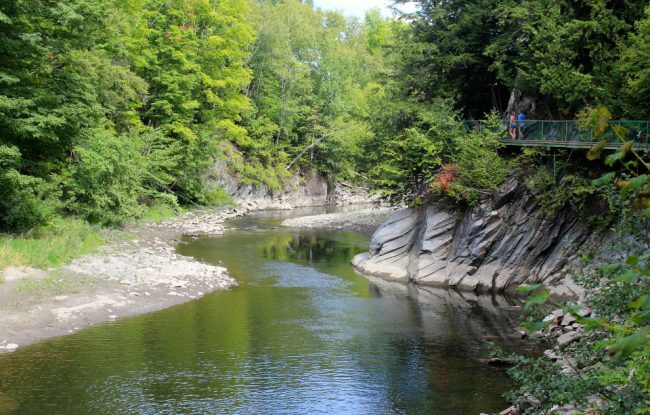 If you’re willing to get off the beaten path, the Coaticook Valley, known mostly to local vacationers, is located less than two hours due east of Montreal in a region called the Eastern Townships. This is a good option if you want to explore Quebec’s countryside without having to drive too far. The region (called “Cantons de l’Est” in French) is also located right across the US border from Vermont and Maine. My friend dislikes cities, so although we were staying in a B&B on the edge of Sherbrooke, the largest city in the region, we spent our entire three-day week-end around the villages of Coaticook and Compton. Planning our stay for the week-end after Labour Day meant that we had most of the sites to ourselves, including the hiking trails around the Coaticook Gorge. 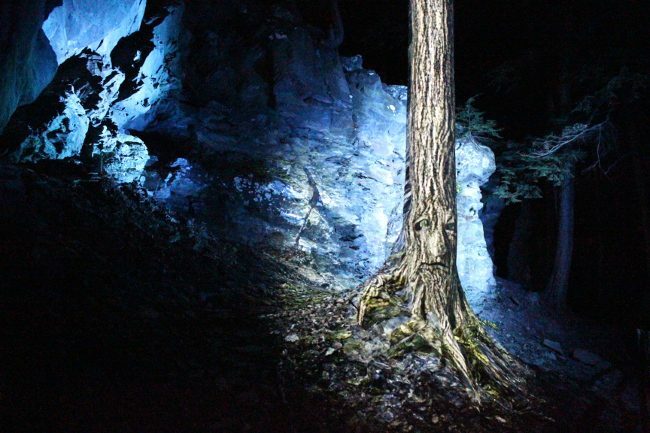 The only exception to this relative quietness was the gorge’s insanely popular night attraction: Foresta Lumina. 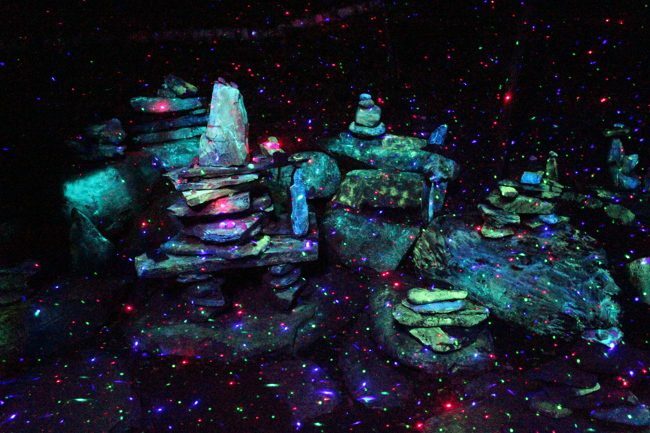 Wrapping up its third successful year, Foresta Lumina still attracts thousands of visitors on any given night, even as the evenings are getting cooler. What is it? Imagine a night walk through an illuminated forest, and across a suspension bridge, while special effect projections, animations, and an original soundtrack recount a fairytale based on the region’s mythology. The attraction is designed for people of all ages, but there is no doubt that children will be the most enthralled by the experience. For my part, I was also quite interested by the technology. The show was created by Moment Factory, an internationally-renowned Quebec company specializing in public space entertainment. The whole thing was very well done, respecting the natural environment, and never becoming tacky. Of course, the “magic” would have been enhanced without the crowds and the squealing children. Admission works on a timed-entry system and several people told me that the later showings consist mostly of adults and are much quieter. 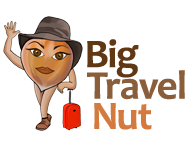 Even though you buy your ticket for a specific entry time, you can stay as long as you want (until closing). Plan on around an hour. If you go: Tickets cost CAD$22.28 for adults (including all fees and taxes). It’s better to buy online in advance as spots are limited to 350 per half-hour and fill out fast. The season runs from mid-June to early October, with daily representations during summer, and Friday/Saturday only the rest of the time. The first show starts as soon as the sky is dark. 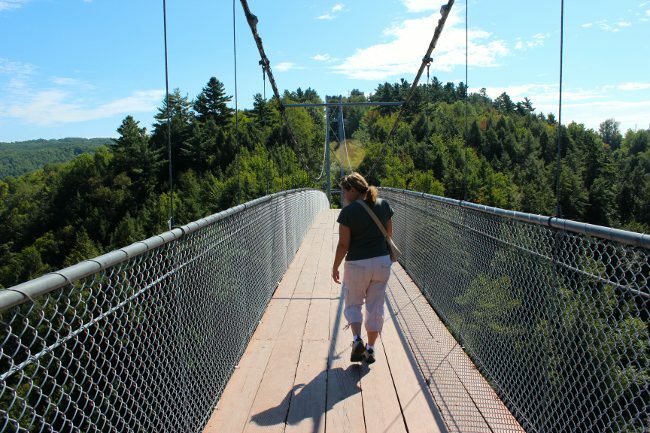 The following morning, we put on our hiking shoes and drove back to the Coaticook Gorge to do some hiking in the park. I was also curious to walk across the pedestrian suspension bridge in the daytime, since obviously I couldn’t really see the view the night before. When it was opened in 1989, the bridge was the longest suspension footbridge in the world. Even though it has now been surpassed by other bridges, walking its length of 169 metres suspended 50 metres above the river was enough of a challenge for my friend who is not a fan of heights! 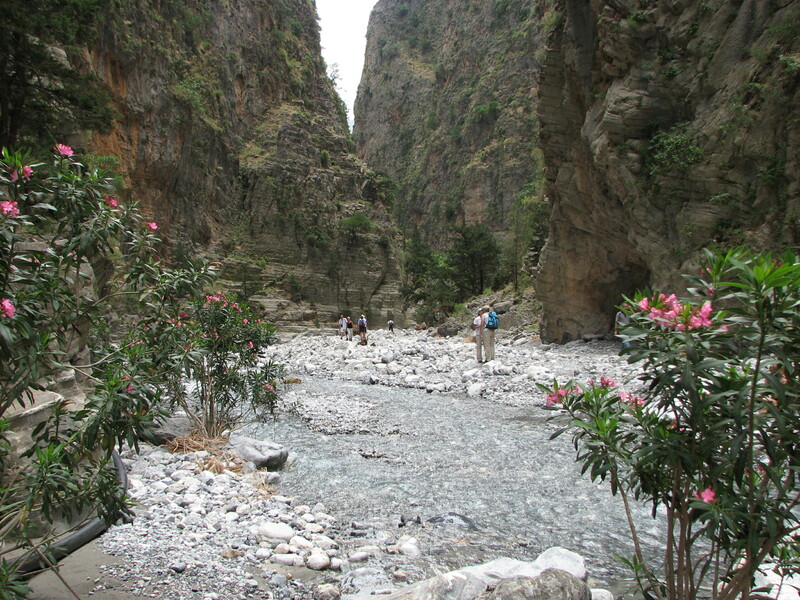 The gorge’s park, which features a campsite, is divided into three areas with trails ranging from 2.0 to 8.5 kilometres. You can spend all day hiking the different trails if you wish. We walked around the “Gorge” area and did a small loop in the “Mountain” area (narrower dirt trails). The river was very dry along some parts, revealing the rocky river bed where visitors had built rock piles (cairns). It was a sunny and rather warm day for September, and we were happy to get a breeze from the top of the Couillard observation tower. In summer, it is also possible to go mountain biking or horse-riding through the forest. The area is also popular for bird watching. Winter activities include skating, snowshoeing, sledding, even ice climbing. For something different, ski joering (being pulled by a horse while on skis) will be offered starting this winter! 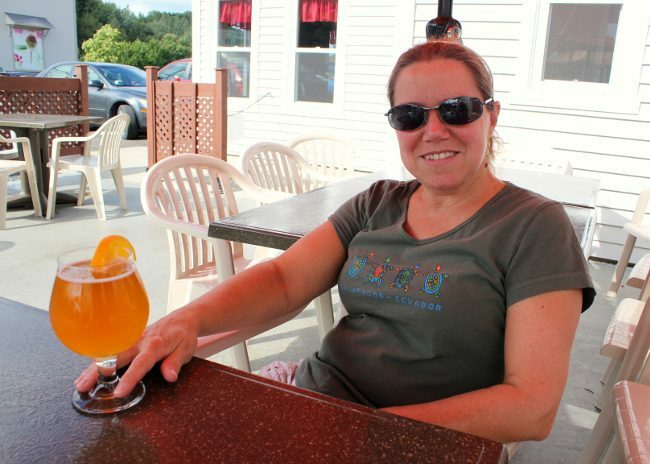 After our hike, we ended up at the Microbrasserie Coaticook (microbrewery) for a cold beer and a snack. For some mysterious reason, my friend and I almost always end up ordering the exact same thing from menus! This time it was a beer called “La Vache Blanche”, a Belgian-style white beer flavoured with orange rind, coriander, and wildflower honey. Yum. If you go: It costs CAD$7.50 for adults to enter the park, which is open daily in summer, but week-ends only in late spring and early fall. The summer season runs from Victoria Day week-end until Canadian Thanksgiving (essentially late May to early October). In December, the park re-opens for the winter season. So what else is there to eat and drink besides ice cream and beer? 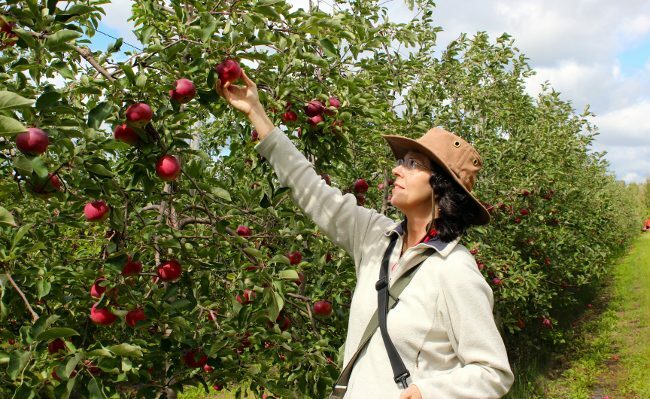 In Compton, a village 13 kilometres north of Coaticook along highway 147, we stopped at a bakery, a chocolate shop, a cheese shop, as well as an orchard where we picked our own apples! The bakery, Pause Gourmande, offered all the usual suspects: loafs, cakes, and cookies, in addition to French baked goods such as croissants and éclairs. We chose a couple of mini-pizzas called “fougasses” as well as a vegetarian paté my friend swore by, and turned them into dinner. Almost next door, the chocolate shop Xocolatl didn’t disappoint, with truffles in unusual flavours such as cinnamon and cayenne, lavender, and pineapple and ginger. A couple of kilometres up the road, orchard Le Gros Pierre lets customers pick their own apples. They provide you with a plastic bag (one of two sizes) and you are billed per bag, not per weight. We spent half an hour in the orchard and filled our small bag to the brim! On Chemin de Hatley, Fromagerie La Station produces five kinds of organic cheeses, a couple of which have won awards. They offer tastings, and even make grilled cheese sandwiches. We figured these would make a good late lunch on our third day, to go along with the apples we picked that morning. As you’ve probably figured out by now, the region requires a car. There is a free shuttle from the village of Coaticook as well as from the campsite to Foresta Lumina, but you need your own vehicle to get to Coaticook. As a small village, it is not particularly well endowed with accommodation. 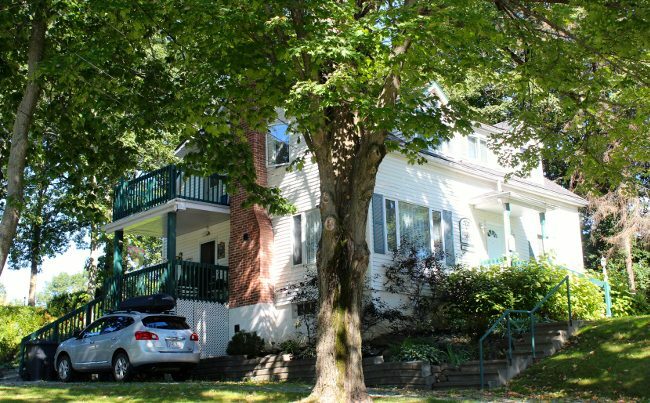 Since we were not camping, we chose to stay in Lennoxville (near Sherbrooke) in a charming B&B called Les Matins d’Antoine which rents five rooms on the second floor. Being the end of the season, we were the only guests, except on the Saturday night. At less than CAD$100 a room, including a delicious filling breakfast, it was a good deal, and the hosts were very friendly. The only negative was the location along a busy road, so I would recommend bringing earplugs if you stay here. All in all, it was a well-filled yet relaxing week-end. My friend, who’s been “camping” (in an RV) all over the province for years, assures me that the Coaticook area has become her favourite destination for the variety it offers and its proximity to the city. Note: Our visit to Foresta Lumina was hosted by Parc de la Gorge de Coaticook. As usual, all opinions are my own. Enjoyed this article? Sign up for my newsletter or “Like” my Facebook page to be notified of new posts.